In Part 1 of The Great (Kitchen) Outdoors, we went over some outdoor kitchen cabinet and countertop options worth considering. Instead of leaving you hanging with a partial project, we decided to finish up with a couple more complimentary options for your outdoor kitchen project. There are several options for ground covering in your outdoor space. Concrete – has always been a “go-to,” and now is popular when stamped and dyed with a pattern. It does have a few issues with fading and cracking, so this option may require a little more up-keep. Stone – gives a natural look and feel, but does cost a little more to install. Brick – has been popular for years and gives that “Old World” look, but also leads to more maintenance issues. One downside is that it tends to hold moisture which can cause a slippery surface, so if you have a shaded area you may want a different option. Pavers – are now very popular choice. You can get them in many different shapes and colors, and price wise, this option comes in on the lower end of the scale. 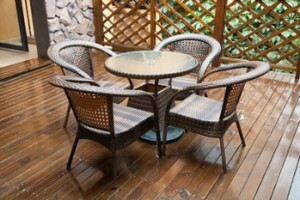 Decking – is a popular option as well. If this is more the direction you want to go in, there are options for wood, plastic and composite materials-just make sure to do your research on the up keep. When choosing a shelter you can make your decision as simple as a sun umbrella, or opt for a more fixed solution, such as a solid roof. However, for even another option, Pergolas have become a very popular choice for outdoor spaces. They add character when left open, or can be outfitted with plexi glass, synthetic tiles or metal roofing, and are solid enough to accommodate mounted task lighting. So, whether you are creating a space to entertain family and friends or simply just want a backyard retreat, a new outdoor kitchen and entertainment space is sure to provide you with years of enjoyment and may even increase the value of your home.